Unica Zürn, “Untitled,” 1961. Ink on paper, 12 3/8 x 9 1/4 inches. Courtesy of Ubu Gallery, New York & Galerie Berinson, Berlin. © Brinkmann & Bose Publisher, Berlin. Unica Zürn, “Untitled,” 1963. Ink on paper, 19 1/2 x 25 1/2 inches. Courtesy of Succession Zürn, Berlin. © Brinkman & Bose Publisher, Berlin. Already an established author in postwar Berlin, Zürn, was introduced in the early 1950’s to the practice of automatic drawing, and to the Paris Surrealists with whom she would collaborate and exhibit, by her partner, Hans Bellmer . 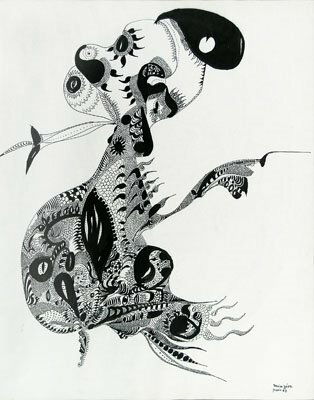 Though largely unrecognized contributions to late Surrealism, the resulting drawings and texts, the majority of which were produced during an intensely productive two decades also marked by a series of mental crises, are imbued with the movement’s fascination with the poetic force of madness and Zürn’s own vivid experience of illness. 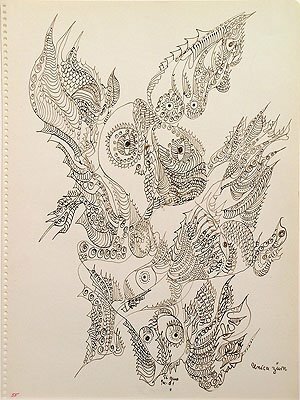 At once playful and haunting, Zürn’s body of work in drawing evinces one of the most febrile imaginations of the past century, tragically cut short by her suicide in 1970. Zürn produced numerous expressionistic short stories that were published in German newspapers throughout the 1950s before moving to Paris with German Surrealist artist, Hans Bellmer. During the following decade and a half, Zürn produced paintings and drawings while living in Paris, becoming acquainted and exhibiting with many artists in the Surrealist circle, including Andre Brenton, Max Ernst, Man Ray and Marcel Duchamp. From 1953 to 1964, Zürn composed nearly 124 anagram poems, many of which provided the central framework for her later experiments with prose, including her autobiographical novella, Dark Spring (1969), and more avant-garde texts such as Im Hinterhalt (1963) and Die Trompeten von Jericho (1968). In the early sixties, she began suffering a series of mental crises leading to intermittent hospitalisation during which she continued to draw and write poetry. In October 1970, having been released from a clinic, Zürn returned to Paris and Bellmer; on the morning of October 19, Zürn leapt to her death from the balcony of the apartment the couple shared on Rue de al Plaine – as she had described in the last pages of Dark Spring. This entry was posted in drawing, Unica Zurn on July 4, 2009 by kristindagostino.